Who Wants To Be A Millionaire slot needs no theme explanation as there aren't many people who haven't ever watched this famous Endemol TV quiz show. By the way, this isn't the first slot built on this TV show, Ash Gaming have their own version. 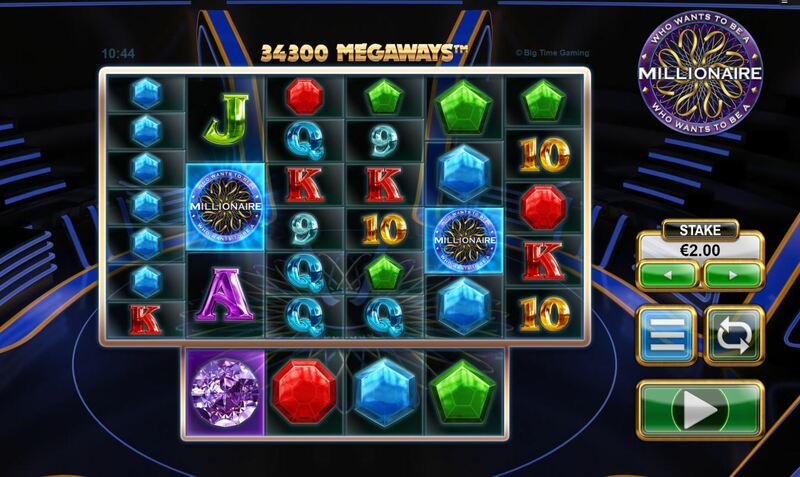 Here we have Big Time Gaming's Megaways set up as with numerous other games such as Bonanza, Extra Chilli and White Rabbit and that's without adding numerous Blueprint Gaming versions such as Diamond Mine and Buffalo Rising! The reels sit over a background imitating the darkened TV studio of the quiz set and you won't be surprised to know the soundtrack is the gentle music that featured in the show too, but otherwise the win and reel sounds are the same as the other BTG Megaways games. Who Wants To Be A Millionaire was a high-risk quiz show in its time, so will we leave with our bankroll intact or shall it be a case of "but we DON'T want to give you that..."
We have the random rows of the Megaways mechanic here so our six reels can display 2 to 6 rows each with a scrolling line of 4 symbols under the centre four reels. So the least amount of ways possible in any spin is 2-3-3-3-3-2 for 324 or 7 rows on all six reels for 117,649 ways, the maximum. You can bet from 0.20 to 100.00 per spin. Symbols can appear stacked up to 7-high down to single with the exception of the game logo scatters and Wilds only appear singly on the scrolling bar underneath the centre 4 reels. When wins occur all winning tiles are removed and replaced by cascades from above. The icons and pays are the same as on Bonanza with 50x for 6-of-a-kind Diamonds, 7.5x for Red Gems, 2x for Green or Blue Gems with six card values ranging from 1.75x down to 0.8x. So how near can we get to the magic million here? Right, Who Wants To Be A Millionaire slot is based very closely on Extra Chilli except there's no feature buy possible, but the feature gamble remains. 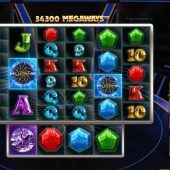 This means that should 3 game logo scatters appear in view we are given 8 free games which are played with an increasing multiplier for every winning action. You can get 4 extra spins for 3 scatters in the scrolling bar underneath and 8 extra for 4 but it's what happens before the spins begin that's important here. Before we start the free games you will notice a rising scale based on the one from the TV quiz. It begins with 8, then 10, 12, 14, 16, 18, 20, 22, 25, 30, 40 and finally 50. You have 2 'safe zones' at 10 and 20 free games where you cannot lose but the point to remember here is that with a standard 3-scatter trigger you only begin on 8, and each extra scatter over 3 will start your gamble ladder one position higher therefore with the maximum 8-scatter trigger you'd start on 20. The game now selects a lifeline from 'ask the audience', '50-50 split' or 'phone a friend' but usually it's 'ask the audience'. You will have 4 choices from A, B, C and D and although the audience will heavily favour one answer with about 80% this doesn't necessarily mean they're right - you can still lose and if you gamble from the 8 spins for 10, you get nothing if you lose! As you progress up the gamble ladder the audience percentage for the favoured answer gets less and so do your chances of winning. It's very hard to get to the next safe level of 20 spins and anything beyond that will be ridiculously hard to achieve. You can collect at any time and commence your free spins total with increasing multiplier for each separate winning action. The results aren't usually good for 8 or 10 spins either, I saw an average of around 30x bet.